Figure 2 Side-chain and main-chain conformational changes in antibodies. (a) Superposition of the native and antigen-bound coordinates for the anti-progesterone Fab DB3 [50-52] (PDB codes 1DBA, 1DBB). The view is looking down into the antigen-binding site, with the Fab light chain on the left, the unliganded DB3 in light gray, and the liganded DB3 in darker gray. The CDR loops for the antigen-bound Fab are colored in red, while the CDR loops for the unliganded Fab are colored by CDR, with CDR L1, L2, L3, H1, H2, and H3 being colored blue, purple, green, cyan, pink, and yellow, respectively. The progesterone antigen is shown in a red CPK rendering. In DB3, there are no significant main-chain movements upon antigen binding; however, TrpH100 is located in the binding site in the unliganded Fab (yellow), while it rotates out of the binding site when progesterone is bound (red). (b) Superposition of the native and antigen-bound coordinates for the anti-tumor Fab BR96 [28,30] (PDB codes 1UCB, 1CLY). The view and coloring for this and all the panels are as for (a). The bound antigen (red CPK) is the Lewis Y nonoate methyl ester. BR96 shows large conformational changes in both the L1 (blue) and L3 (green) CDR loops. (c) Superposition of the native and antigen-bound coordinates for the anti-ssDNA Fab BV04-01  (PDB codes 1NBV, 1CBV). The bound antigen (red CPK) is tri-thymidine. BV04-01 shows large conformational changes in the L1 (blue) and H3 (yellow) CDR loops. (d) Superposition of the native and antigen-bound coordinates for the catalytic antibody CNJ206 with antigen para-nitrophenyl methyl-phosphonate [59,65] (PDB codes 2GFB, 1KNO). This Fab shows large con-formational changes in CDRs L3 (green) and H3 (yellow). (e) Superposition of the native and antigen-bound coordinates for the mature catalytic antibody 48G7  (PDB codes 1AJ7, 2RCS). The bound antigen (red CPK) is 5-(para-nitrophenyl-phosphonate)-pentanoic acid. H2 (pink) undergoes large conformational changes. (f) Superposition of the native and antigen-bound coordinates for the anti-lysozyme antibody HyHEL-63  (PDB codes 1DQQ, 1DQJ). The lysozyme antigen is shown as a transparent CPK model in order to see the footprint of the protein on the CDR loops underneath. This Fab has conformational changes in the H2 (pink) and H3 (yellow) loops. Figure 3 Topographical changes in antigen binding sites due to conformational changes. 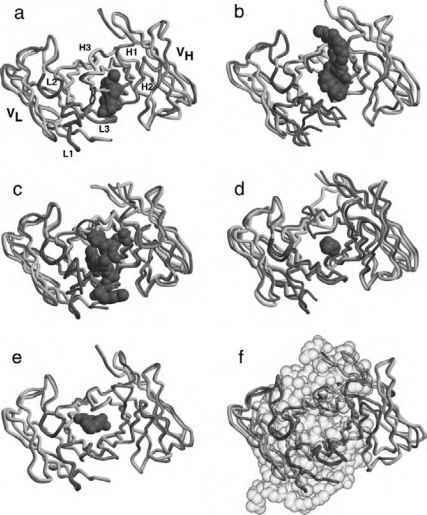 Fab 50.1 (top panel) is shown before (left) and after (right) antigen binding. The view is that looking down into the antigen binding site, as in Fig. 2. The peptide binding site is highlighted in purple on the lig-anded antibody surface, with peptide antigen omitted from the figure for clarity. The combination of an H3 rearrangement and a large VH-VL domain rearrangment have combined to substantially lengthen and widen the groove for peptide binding. 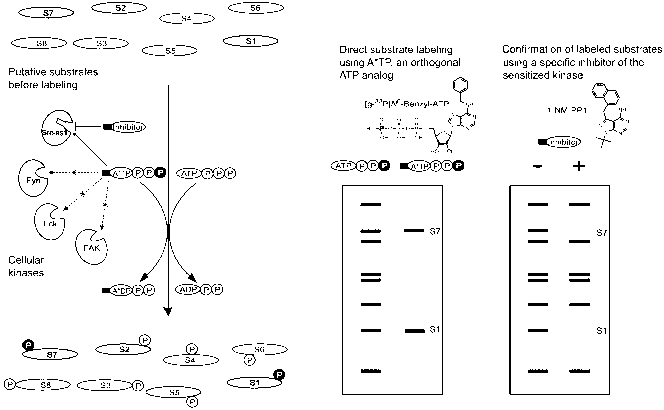 Fab DB3 (bottom panel) is shown before (left) and after (right) antigen binding. The approximate binding site for progesterone is highlighted in purple. The structural change required for its small hapten to bind is the opening of a small pocket for the binding or steroids such as progesterone. 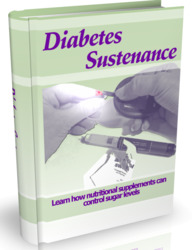 This change is mainly due to a tryptophan residue that fills the pocket in the unliganded Fab but then moves out of the way to allow steroids to bind. Solid surfaces were calculated with GRASP . Figure 4 Conformational changes in Fab 50.1 [20,61] (PDB codes 1GGI, 1GGB). 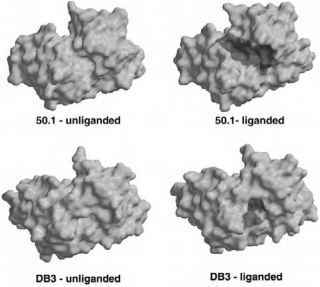 The unliganded and liganded Fab 50.1 structures are superimposed using VH framework residues. The view is looking down into the antigen-binding site, with the Fab light chain on the left and the unliganded and liganded VH domains in light and dark gray, respectively. CDR loops for the VH domain are colored by CDR as in Fig. 2. The VL domains from the liganded and unliganded Fabs are colored blue and cyan, respectively. The VL domains differ in their relative orientation to the VH domain by about 15°. Large conformational changes in the H3 CDR loop (yellow and red) are also visible. 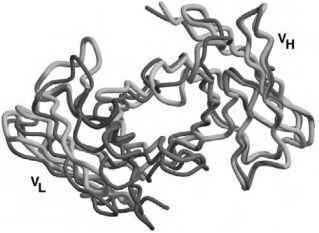 These combined conformational changes serve to widen and lengthen the binding groove for the peptide antigen. most frequent CDR conformational changes are found in CDR H3. In an analysis of the 36 Fab or Fv fragments that exist in both free and bound forms, out of 115 total comparisons (some Fabs or Fvs have more than one molecule in the crystallographic asymmetric unit or have been solved in multiple crystal forms) 13, 5, 9, 13, and 38 pairs of structures were shown to have significant conformational changes (total rmsd for CDR residues >1.0 A) in CDR loops L1, L3, H1, H2, and H3, respectively. The largest H3 movement seen thus far is for the catalytic antibody CNJ206 , where the tip of the H3 loop has a main-chain rearrangement of about 16 A. Catalytic antibody 5C8  and the anti-HIV-1-peptide antibody 50.1  also show large changes in this CDR loop. The H3 CDR loops of CNJ206, 5C8, and 50.1 are not long; CNJ206 and 5C8 both have only two amino-acid inserts after residue H100, while 50.1 has a three amino-acid deletion in this region.